The final whistle had only sounded when the first SMS message arrived from a desperate Dublin fan with the request that will be heard many times in the coming weeks – any chance of a ticket for the All-Ireland football final? That’s what happens when the Dubs are still playing football on the second last Sunday in September. It’s also what happens when they’ve been involved in a game against Kerry that will live long in the memory. How long is open to debate. One young man I know described it as the greatest game in living memory which is great – until you realize that he’s in his early twenties and his living memory doesn’t stretch as far as some of the great Dublin-Kerry clashes of the seventies and early eighties. Another young scribe called Gordon Manning, from the town of Kells, came up with a great description of the 3-18 to 3-11 win for the capital over the Kingdom – it was a football match which ended with a hurling score. Every commentator worth his or her salt agreed on Sunday night radio and Monday back pages that it was a game worthy of the classic title as Dublin finally pulled away from Kerry with seven unanswered points in the final four minutes of play. And they are all right, even if there were times when the defending was haphazard from both sides, times when the willingness of both sets of players to attack at all times was just plain crazy. Football purists will argue that such a brazen attitude will eventually cost a team like Dublin – or Kerry for that matter – dearly in a game and they might have a point. If Kerry weren’t so hell bent on scoring goals in the first half on Sunday -- and they beat Stephen Cluxton not once but three times -- maybe they wouldn’t have conceded a goal and nine minutes in the same period. But if Dublin weren’t so hell bent on creating scoring chances late in the game then substitutes Kevin McMenamon and Eoghan O’Gara might never have got the goals that secured their place in the All-Ireland final against Mayo on Sunday, September 22. It’s all about opinions when you’ve just witnessed a game as good as Dublin against Kerry was on Sunday. And in my worthless opinion, it was bloody good. And just what Gaelic football needed. One of the main reasons why the Irish nation is still celebrating this game is the very fact that open football was on open display for all 70 odd minutes on Sunday. And that’s such a relief after the puke football served up by some teams we could mention this summer. 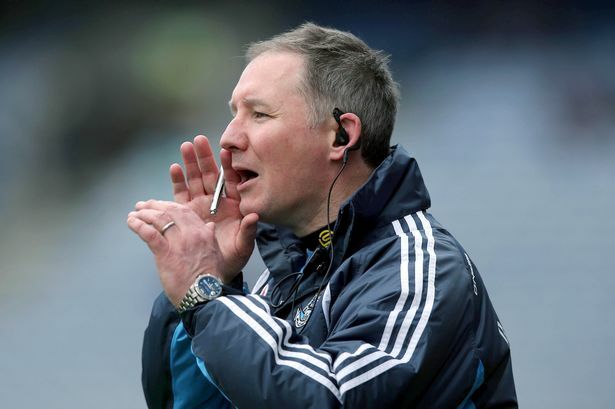 The good news is that Dublin boss Jim Gavin has no intention of abandoning his free-flowing football when his team returns to the All-Ireland final stage for the second time in three years. Considering they haven’t been shy about scoring goals in the championship this summer, that can only make for a great, great final. And that’s what we all want. After last Sunday’s appetizer, it’s the least we can expect. And no, I don’t have any tickets for the match! Not even one for myself. SOCCER: Bizarre red card at Belfield on Friday night when Dundalk gained top spot in the Airtricity League courtesy of a 2-0 win against UCD. Young UCD defender Michael Kelly was yellow carded by the match referee for encroaching into the pitch as he was being introduced as a substitute and then received a second yellow card just three minutes later for a challenge on Stephen O’Donnell. Little wonder that UCD boss Martin Russell called it one of the strangest decisions he has ever witnessed on the football field. And he’s a long time in the game. RUGBY: Pat Kenny has been wheeling out the big names all week in his bid to make an impression in his new job at Newstalk after quitting RTE, so it was no surprise to see Mickey Harte and Brian O’Driscoll trotted out on Tuesday. Dricco did reveal that the coming season will definitely be his last in professional rugby, but there’s nothing new in that, he’s been saying it for months now. Problem is, none of us really want to believe him. SOCCER: Stephen Ireland’s deadline day move to Stoke City, on loan from Aston Villa, can only work out well for all concerned. He may be a bit of an enigma who doesn’t seem to want to play for his country, but Ireland is also a great footballer. It’s about time he proved that again, and the move to Stoke should give him that platform to do so. HURLING: Love him or hate him, you can’t deny that Davy Fitzgerald will add his very own color to the sideline when Clare take on Cork in the All-Ireland hurling final on Sunday. Unfortunately for the Banner, Davy’s influence won’t be enough to stop Jimmy Barry Murphy’s Rebels from winning the Liam MacCarthy Cup again. The Gooch, otherwise known as Colm Cooper, has many detractors and many defenders prepared to go to any lengths to try and stop him sparkle for Kerry as we witnessed again in the All-Ireland semi-final on Sunday. He is also, on talent and skill alone, the very best Gaelic footballer in the land, and he proved that with a majestic display against Dublin. How RTE didn’t award him the Man of the Match award is a mystery. Premier League bosses were involved in over a billion dollars worth of business during the transfer window which closed on Monday, but the most idiotic deal of all has to be the decision by Real Madrid to pay a world record fee of well over a $100 million fee, depending on who you listen to, for the Welsh midfielder Gareth Bale. He’s good but he’s no Ronaldo, and his time at Real will prove it. Such a fee when there are children starving in the world is immoral.